It now seems as though Ronda Rousey’s WWE debut is an inevitability that is set to be realized sooner rather than later. Rousey’s UFC career peaked at a time when the franchise was actively seeking to gain geographical ground on the WWE brand. Compared to WWE events, UFC fights have been held in a far more diverse array of locations over the past decade. Earlier this month, Deontay Wilder became the latest high-profile athlete to voice his opinion on the importance of regular stateside appearances for fighters. Wilder was, in this instance, speaking out current heavyweight champion Anthony Joshua. British Olympian Joshua is currently priced at +600 in the latest boxing betting stakes to stop his next opponent in the third round. The US is, of course, still by far the richest source of PPV buys across all forms of sports entertainment. Although Rousey is already a well-established global icon, the general implication is that regular WWE appearances would boost her profile to drastic new highs. Every successful WWE star in history has been involved in several high-profile feuds and Rousey would be no exception in that respect. A feud with former MMA fighter Shayna Baszler would be an obvious way to begin, given their existing common ground. Those responsible for WWE storylines will already know that a UFC-style bout in a WWE ring would represent corporate suicide, but there is still the potential to make it work through a classic, tried-and-tested method. Specifically, Rousey’s outspoken nature could be used to make her an antihero, thus creating the opportunity to forge a new battle of factions. This concept first became popularized in the 1990s, but is still something of a rarity where women wrestlers are concerned. Prominent examples of scripted in-fighting include WWE’s long-runningD-Generation X vs The Corporation storyline, and the WCW vs NWO feud, which raged inside rival brand WCW throughout the second half of the 1990s. These feuds also coincided with the ‘Monday Night Wars’ in which the respective flagship shows of each brand competed for ratings. The situation reached a head in April 1998, when several DX members launched an invasion of WCW Monday Nitro. Though the backstage feud between Ronda Rousey and Charlotte Flair at this year’s Mae Young classic was scripted, many wrestling fans have chosen to read into it with significance. 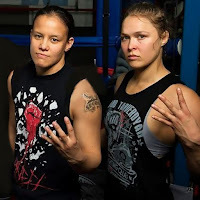 In essence, the presence of Rousey and several other MMA fighters could be construed as a minor invasion, creating a precedent for a more resounding one if Rousey ever joins the WWE. For anyone who believes that the UFC can gain ground on the WWE in the PPV buy stakes, this would be a welcome development. Meanwhile, those behind WWEs storylines could potentially snare a significant number of UFC fans that would not normally tune in to the WWE. In short, everybody would win. Ronda Rousey and Charlotte Flair face off backstage at the Mae Young Classic. Whether Rousey has the charisma to become another leading insurgent, like Triple H of DX, or Hollywood Hogan of NWO, remains to be seen. What matters as much as Rousey’s antihero status is the importance of her equal, and opposite, foil in her first major feud. Thus far, Baszler has yet to establish a bonafide gimmick, but her progression via natural means (participation in the Mae Young classic, and inclusion on the NXT roster) provides justification to make her a loyal ‘face’ of the WWE. Ultimately, this would be the perfect backing to a feud with potential antihero Rousey.